Every summer, the art teacher in my school does bingata lessons. I did this last year and the year before. First, a water-soluble resin is put through a stencil with wire and dried. Afterwards, you can paint directly on the dried parts. The painting process is similar to making woodblock prints (ukiyoe). You first apply the base layer, which is usually a light color. In all of my paintings, I use really light colors that contain yellow (unless I plan on painting blue or purple over them). It’s really important to know what the final picture will look like so that you can plan the base accordingly. If not, it’s easy to drawn out the base color with indecisive colors. After the base colors are applied, you dry the dye with a hair dryer and go on to the next part of the painting. The second part of the painting process is putting the final shades and tones. I use a small soft brush and a regular brush (one in each hand) and blend the colors. 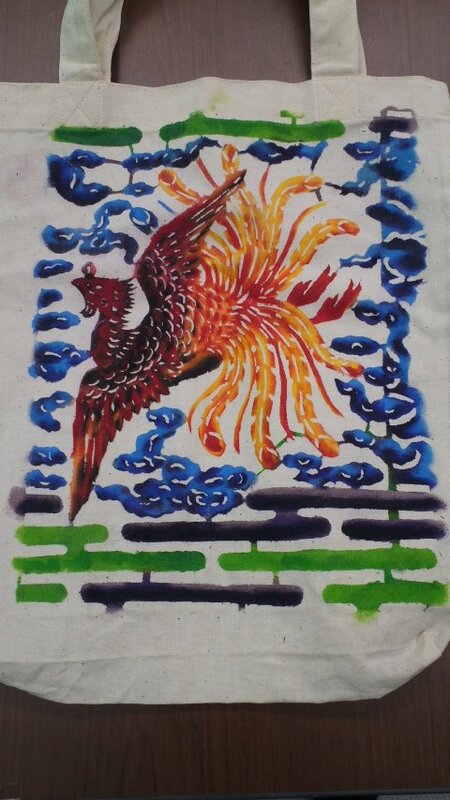 Because I started out with bigger brushes, the phoenix in this image came out funny. It’s my own lesson to choose my brushes carefully from now on. Once all the colors have been applied, you dry the dye until the resin flattens. Place your finished painting into water for a few hours, or if you want the resin to come off more easily, put it in water for a couple of days. Finally, you wash the resin off without rubbing the fabric together, and let the fabric dry. This one wasn’t my favorite bingata because I only had an hour to make it where I previously took two or three hours to make. This entry was posted in Art (芸術), Art Projects (芸術のプロジェクト) and tagged bingata. Bookmark the permalink.